It is Friday so time for a look back at aviation history here at the 3DB and today I want to take you back to the beginnings of commercial aviation and talk about airlines and airliners. I think it is fair to say that most Aviators are familiar with the beginnings of Pan Am, TAT, and others but how about Lawson Airlines? 1. 1909…..Delag was the world’s first airline in revenue service and they operated Zeppelin airships. 4. 1919….KLM and Avianca began operations. 8. 1926….Varney Airlines (which became United), Eastern Airlines, Northwest Airlines, and Colonial Air Transport (which became American Airlines) began operations. 9. 1927….Pan American World Airways began operations. In the list above, which is but just a few of the world’s airlines, I don’t see a date for the company we are going to talk about today – Lawson Airlines. There have been numerous airline companies that history has forgotten, such as Aeromarine who paved the way for Pan Am, but let’s revisit the years 1908 to 1928 and talk about an airline that history has forgotten. Three weeks after Alfred William Lawson’s birth in London on March 24, 1869, the Lawson family set sail for Canada and, several years later, crossed the border to settle in Detroit. There young Al grew up and trained to be a coat-maker. But a more glamorous life opened when, at the age of 18, he signed on to pitch for a semi-pro baseball club in Frankfort, Ind. Pitching engagements with several Midwestern minor league teams followed in 1888 and 1889. Although Lawson’s early record is not fully documented, it apparently was good enough to give him a chance in the National League in 1890. But there he was found wanting. In his May 13 debut with Boston, he matched pitches with Mickey Welch of New York and lost 7-2. In two games pitched for Pittsburgh, the results were even unhappier – on May 28, a 12-10 loss to Philadelphia, followed by a 14-1 loss (and three errors by Lawson) in a June 2 contest with Cap Anson’s Chicago team. Thus, within a three-week span in 1890, Lawson’s major league career began and ended. 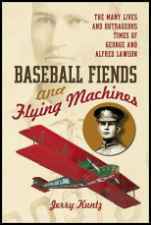 That same year in Philadelphia, in a remarkably rapid transition, he began to publish and edit Fly, the National Aeronautic Magazine, the first popular American journal devoted mainly to promoting flight in heavier-than-air machines. Two years later, in New York, he launched Aircraft (a word coined by Lawson), which journal he edited until 1914 and built into an authoritative voice of early aviation. Through these ventures Lawson secured a place as an aviation industry pioneer. The audacity of Lawson’s entry into aviation journalism was breathtaking. What, after all, were the market prospects? By 1908, only three Americans had ever gone aloft in airplanes. Moreover, Lawson had no editorial experience, and his only background in writing was an unpromising Utopian fantasy, Born Again, published in 1904. A school drop-out at age 12, he presumably knew very little about aviation or engineering. But Lawson had two things going for him: a farseeing vision (rare in 1908) of the future commercial possibilities of aviation and a considerable entrepreneurial ability. Where he got the former remains a mystery, but that his entrepreneurship was honed during this baseball years is clear enough. Lawson took his first flight in 1910 and in 1913 became New York’s first air commuter by flying his plane from the North New Jersey beach area to 75th Street in Manhattan. He used his journals to beat the drums for commercial and military development of aviation. In 1913 he sent a message to Congress asking for $10 million for the development of American aviation. When the U.S. entered World War I, he negotiated the financial backing to form his own company in Green Bay, Wisonsin. The Lawson Aircraft Co. designed and built excellent military trainer-plane prototypes, but the war was nearly over before the firm received contracts for large-scale production. At war’s end, Lawson embarked on his most ambitious and estimable enterprise – the attempted founding of the first nationwide air passenger service. He was many years ahead of the field (and probably of the market and available technology) with this idea. Losing his financing in Green Bay, he reorganized his company in Milwaukee. In 1919 he had finished his first plane – a 16-passenger craft having many novel features (some of which became standard in passenger planes) – and flew it without mishap on a triumphal 2000-mile odyssey as far as New York and Washington, D.C., and then back to Milwaukee. This flight was well publicized, particularly in Washington, where, on September 21, he displayed his “airliner” (a neologism that stuck) to a large number of dignitaries. In fact, he took more than a dozen of them on a flight around Washington. Included were six U.S. Senators, the former President of Notre Dame University, and Secretary of War Newton D. Baker and his wife. But this flight was only the prelude to the projected creation of the national passenger service, a dream which now seemed within Lawson’s grasp. The U.S. Post Office enhanced his prospects by awarding him its first large airmail contracts, totaling $685,000. When Lawson’s second plane crashed on take-off in 1921, however, his financial backers, already made jittery by production delays and the deepening 1921 depression, withdrew support. Soon the Lawson Aircraft Co. and the Lawson Airline Co. were no more. A dispiriting blow, but it didn’t shake Lawson’s faith in the merit of the air passenger idea and in himself as the man needed to bring it into being. He gamely made one more try in the late 1920’s, this time pinning his hopes for an airline network on a conception fantastic for its time – a fleet of huge, 12-engine planes, each capable of carrying 125 passengers in a two-tiered compartment (an idea, incidentally, which Lawson patented and licensed profitably to bus and train companies). But the first plane was still under construction when, again, Lawson lost his financing, this time in the Great Depression. With considerable bitterness, he abandoned aviation work forever. Fittingly, in the 1930’s Lawson struck back at “the financiers” by organizing and leading the multi-million-member Direct Credits Society to agitate for his own plan for national financial reform. At the same time, he continued to develop in many books his unorthodox scientific and religious ideas, which he called “Lawsonomy.” Eventually, he founded Lawsonian Religion (six churches operate today) and, in Des Moines, the “University of Lawsonomy,” an institution (now located in Sturtevant, Wisconsin.) from which he hoped would come the seed for a “new species” of humanity, perfected by the study and practice of Lawsonomy. Lawson died in San Antonio, Texas at age 85 on November 29, 1954, bringing to a close an amazing life, to which these few pages can’t do justice. He had come a long way from coat-making and those three major league appearances of his nonage. Although his contribution to early American aviation has not been sufficiently recognized, he is still remembered by a devoted band of Lawsonomists as the best and wisest man they ever knew. 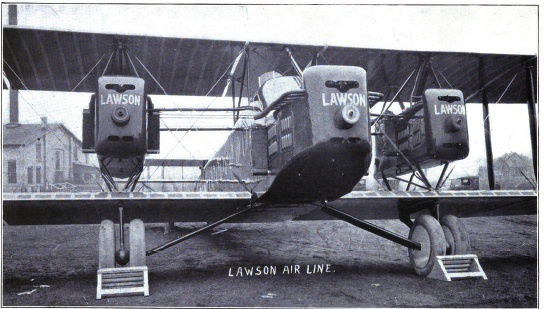 The Lawson Air Line Company designed and built a series of large biplane airliners for use on its planned airline routes. 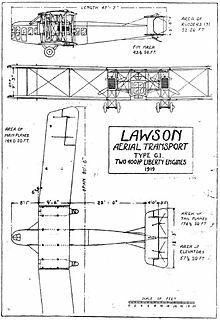 The initial Lawson “Aerial Transport” Lawson C1 or T-1 was built early in 1919 to demonstrate that a large commercial passenger plane could be built. The L-1 was a single pilot, 10 passenger biplane with twin Liberty 400 hp pusher motors. It was followed by the Lawson C.2 or L-2. The L-2 was a tractor biplane also with 400 hp motors, capable of carrying 26 passengers, and piloted by two pilots with differential controls. Mr. Lawson took it on a 2000 mile multi-city tour to advocate commercial air travel. After he completed his 2000-mile flight, Mr. Lawson built the Lawson Midnight Liner for use on the night service between Chicago and New York. The Midnight Liner was larger with three 400 hp Liberty engine – one on each wing and another in the nose. The airliner sported sleeping berths and a shower. 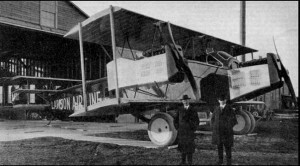 It was his objective to produce large number of these aircraft to outfit his airline, but the 1920 Fall recession deprived Lawson of the investment funds to meet payroll and other development expenses. The first and only Lawson “Midnight Liner” was completed on December 9, 1920. Bad weather, however, delayed its maiden flight. As Lawson’s the financial situation worsened, Lawson decided to fly his new airliner from a space near the factory, rather than make a costly ground transport move to Hamilton Field (now Gen. Mitchell Field). The prepared strip was only about 300 feet long. Lawson finally gave the order to attempt flight on May 8. The aircraft did not clear an elm tree and crashed on takeoff. The pilots were unhurt but the airliner was never repaired. Lawson had a 100 passenger, a double decked version, on the drafting board, but the Lawson “Midnight Liner” was the last. The company folded in 1922, and the assets were auctioned off. The two Lawson Air Liners are renowned due to their size (for the time) and the ambition of its flamboyant promoter, Alfred Lawson. Have good weekend and remember to enjoy time with family and friends, and remember: Protect your profession, protect yourself, and all who will follow in your footsteps..